The Town Scryer: But Why? 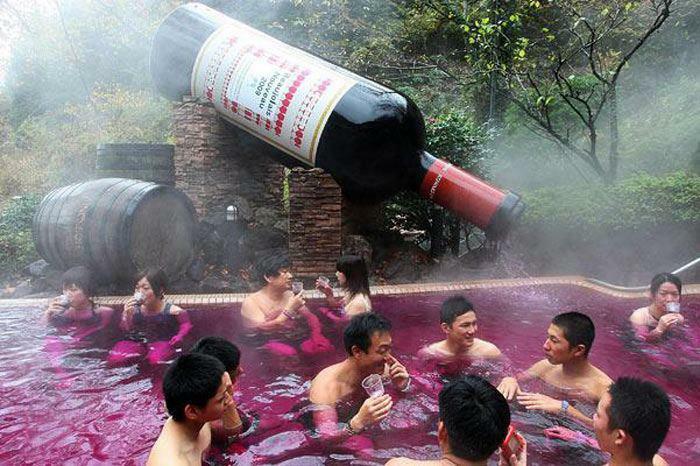 "The Hakone Kowakien Yunessun Hot Springs in Japan, is one of the only places where you can fully immerse yourself in a vat of steaming red wine. The red wine pool features a 3.6m tall bottle of wine that pours Beaujolais Nouveau into the pool throughout the day." Now I have in my youth tasted wine that seems in retrospect better suited for bathing than drinking, but it seems to me to be terribly decadent to actually do so...and not in the deliciously naughty fun way, but in the burning a hundred dollar bill to light a cigar and in need of a karmic enema way. Then again, I have often been accused of being a Liberal by people who seem to be under the mistaken impression that they are insulting me.